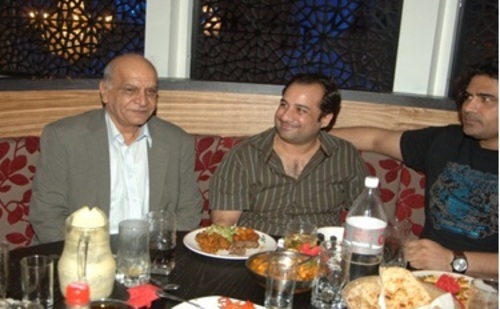 To add to an already star studied clientele, Chak 89 once again recently entertained two very famous Bollywood singers Rahat Fateh Ali Khan and Shafqat Amanat Ali. Both famous for singing for many Bollywood hit films; “My Name is Khan”, “Dubbang” and “RA 1” to name but a few. They came to Chak89 and enjoyed an exquisite meal with senior Mr Khalid. Rahat Fateh Ali Khan first performance was at the age of ten when he toured the UK with his uncle Nusrat Fateh Ali Khan in 1885. In 2010 he won the “Best International Act” at the UK Asian Music Awards. Shafqat Amanat Ali started learning classical music at a very early age. Shafqat rose to stardom when he sang “Mitwa’ for the movie “Kabhi Alvida Naa”, the song was listed in the top of the charts in India. In 2011 His album Kyun Dooriyan was nominated for best album in the Indipop category in the Mirchi Music awards.